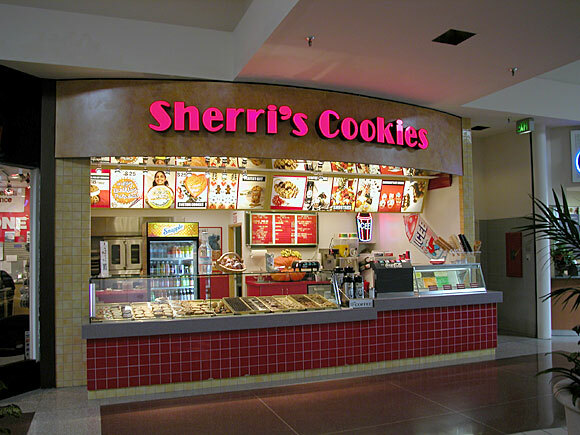 Sherri's Cookies, in the Capitola Mall, is an excellent example of our tenant improvement design work in regional shopping centers. The purpose of a mall storefront is to create interest and attraction, which ultimately induces increased sales. Sherri's Cookies succeeds in this by positing a curved signage bulkhead against the necessarily orthogonal orthodoxy of the mall promenade, by the use of elegant, durable materials to convey permanence, by the "supergraphics" aspect of it's signage, and by it's 100% open, visually accessible facade permitting unfettered visuals of the store's product and menus. Our experience in shopping center tenant design began in 1983 while located in Los Angeles, California. At that time our portfolio consisted exclusively of T.I. designs. Our projects at that time included those in South Coast Plaza, South Bay Galleria, Del Amo Fashion Center, Montecito Town Center, Glendale Galleria, Topanga Shopping Center, Northridge Fashion Plaza, Sherman Oaks Galleria, Beverly Center, Horton Plaza San Diego, and Stanford Shopping Center. Since relocating to the Monterey Bay region our portfolio has included designs in support of the various tenants of Northridge Mall and Capitola Mall, and service to the corporate management offices of both malls. Capital improvements designed for their owning flagship, The Macerich Company, include a two-story service building addition as capital improvements to the Capitola Mall, capital improvements to the Northridge Mall restroom facilities, and designs for their corporate management offices at both Northridge and Capitola Malls.